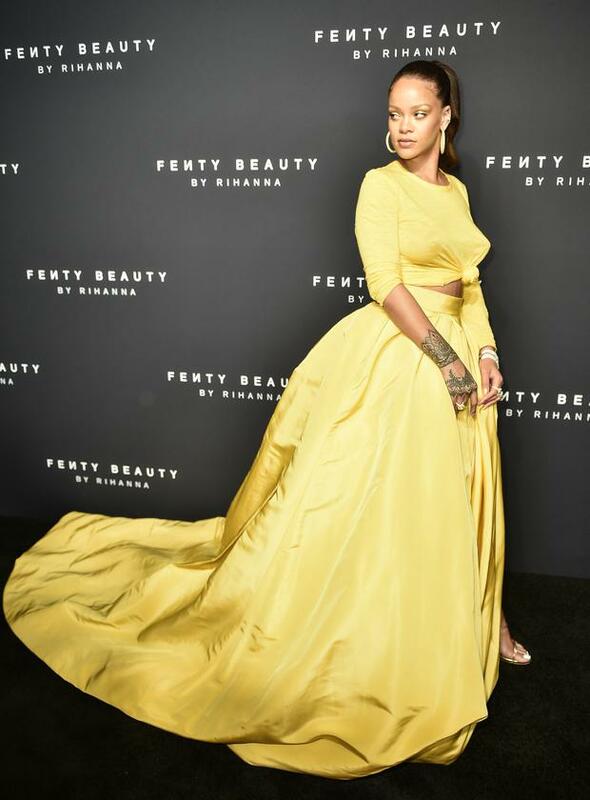 Rihanna is never one to shy away from the limelight, and her appearance at Thursday night's Fenty Beauty launch was no different. The Umbrella singer marked the launch of her new beauty range at New York Fashion Week in a bright yellow co-ordinating long-sleeved crop top and full satin skirt with a thigh-high split. The 29-year-old completed the look with strappy gold sandals, hoop earrings and diamond bracelets and rings. The businesswoman, whose new makeup collection has been eagerly awaited upon by beauty-lovers, found herself at the receiving end of online criticism last month when a sports blogger wrote a column called, 'Is Rihanna going to make being fat the hot new trend?'. However, the superstar songstress responded saying she doesn't care what others think, but takes her role model status seriously and wants younger girls to appreciate their bodies and a have a balanced diet. "It's important young girls know that it's okay to eat the things they like and that's why body shaming makes me so angry. It doesn't really worry me personally, but I hate the message it sends," she told Grazia. "It is absolutely okay to enjoy your food. I love fast food and you are never going to hear me apologise for that. Burgers, fries, hot dogs, pizza, you name it. I'm not saying I eat it every day but when I am on tour or filming, it's quick and easy and I know I am going to burn a lot of it off."